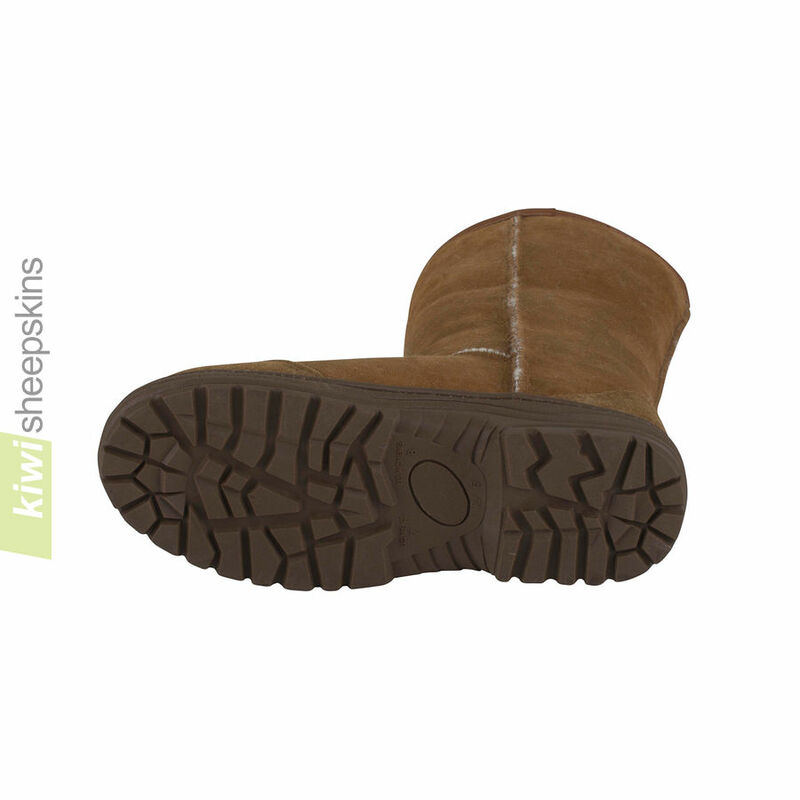 Our tall, full-calf sheepskin boots set the standard and are crafted to our exacting specifications in New Zealand. 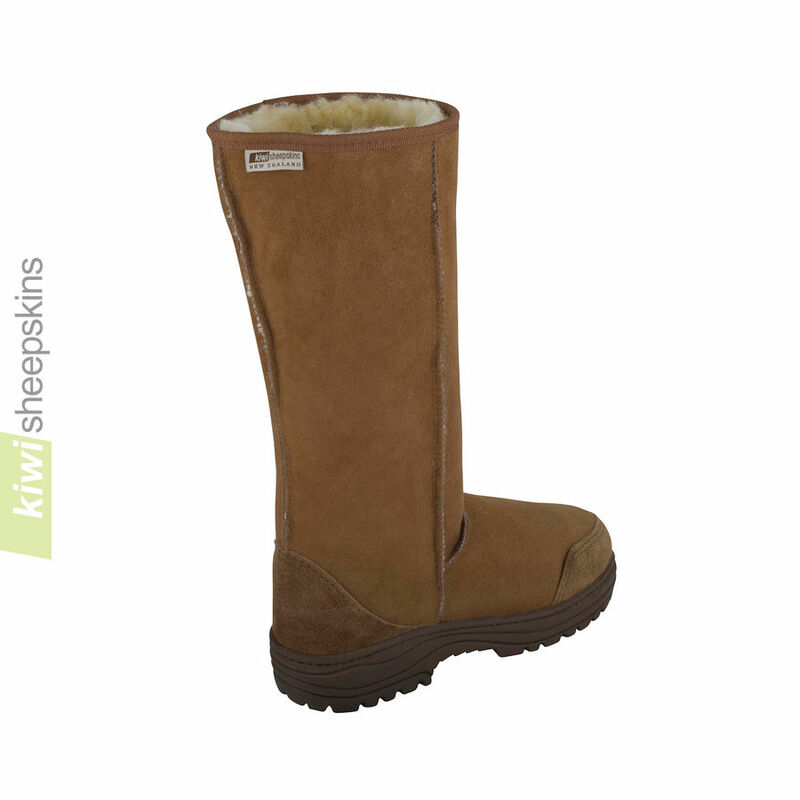 Great warmth and comfort with a timeless, classic look and feel. Our tall outdoor boots are proving to be very popular. Comments/reviews from delighted customers. I just wanted to let you know that our order arrived today, not bad from a timing perspective given that we ordered it on Dec 1 and it arrived Dec 11 here in Los Angeles, CA. But speed was not the only highlight to our experience. My wife and I are long time UGG wearers (since 1983 for me) and we are very happy with the quality of our boots! 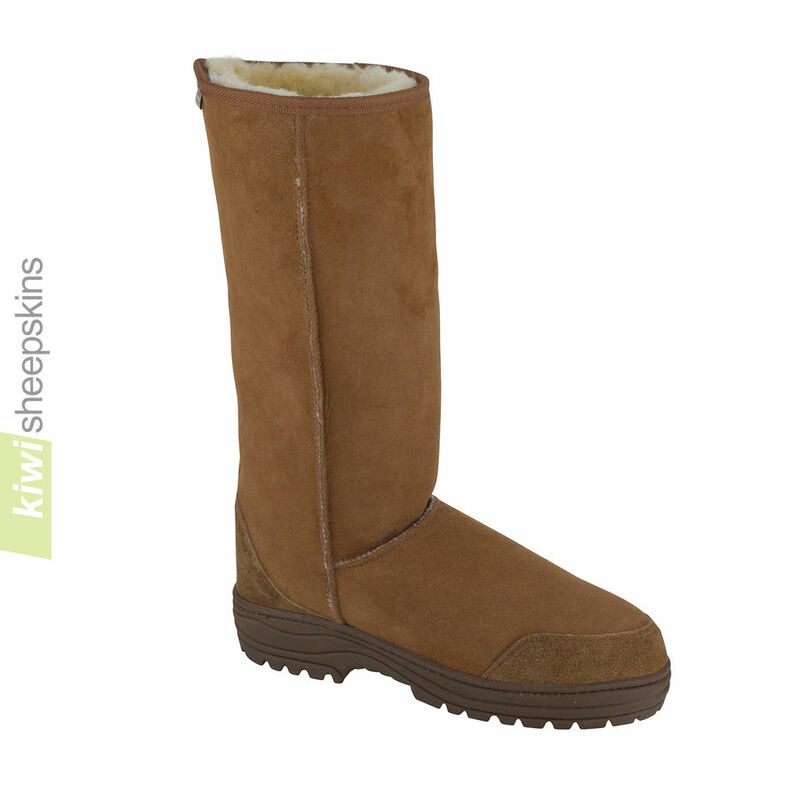 The skins used are of a higher quality than we have found in past UGGs bought from a major manufacturer. As it turns out this other company used to manufacture their boots in Australia but have since turned to a well know Asian country for their manufacturing and the quality has really gone down. The quality of the skins used in your UGGs was apparent immediately and we look forward to wearing them frequently and for many years to come. Thank you again for all of your help and how responsive you were in fulfilling our order so promptly! I just wanted to let you know that my boots have just been delivered and I love them - not that I doubted I would. These are the third pair of Ultimate boots I have bought from you (I already have 2 short pairs) and they are basically all I wear on my feet outside during the Winter - I bought these tall ones specifically for a trip to Poland that we have planned for December, I am now confident that my feet are going to be toasty warm. I also have a pair of your slippers that come out of the cupboard as soon as the weather turns cold and will stay out until it warms up again in the Spring. 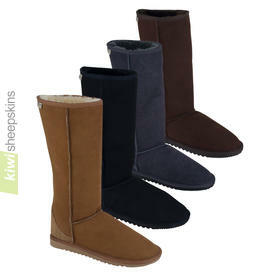 I love your stuff so much that I am recommending you to people rather than them paying over the odds for Uggs. Thank you for producing such a great and reasonably priced product. I live in the Sierra Mountains in California. I received my pirate boots today. I LOVE them. It took only 4 days for them to arrive in my mailbox. I'm impressed how quickly I received them and the quality is beyond GREAT and I am one who is not impressed easy. I wear and 8.5 in American sizing and the 8 women's, men's 7 fit me perfectly. I'll be back, I think I need the sheepskin cap. It's adorable. 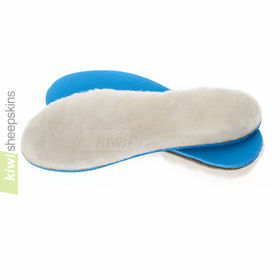 Kiwi Sheeepskins does it again.... great service, fast delivery and amazing product!! Rocking my new Tall Ultimate black boots for the first time today, LOVE them - I already have the Musketeer tan boots I got last year and they are still going strong. I applaud you and your company on the individual attention you give your clients. The speed in which you reply and deliver. I will certainly recommend you to all who enquire about your product. Many thanks. Just wanted to let you know that my new Tall Ultimate Sheepskin Boots have arrived to Toronto, Canada. Delivery was fast and prompt. Thank you for an amazing and fast service, and even more amazing product. 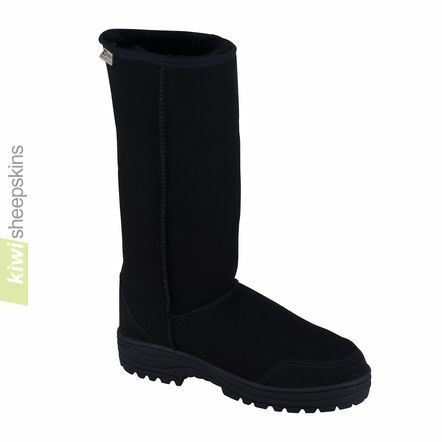 I agree with the other customers, these boots are amazing, even better then Uggs or any other known brand. In the near future, I will order some other products from your collection. 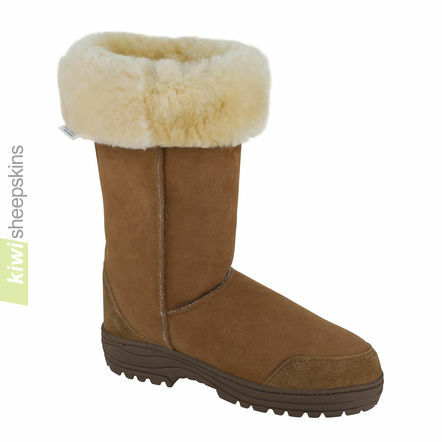 I was well pleased with my Kiwi's, I showed my Ugg queen of a friend your site and I know she's ordered the Musketeers, and now I'm also a fan. 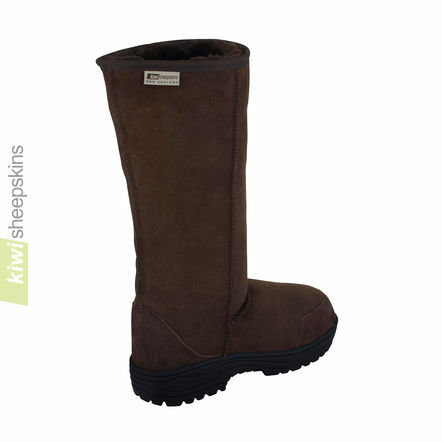 I did love Ugg but now it's you Kiwi and thanks for doing full calf in men's, I originally 7 years ago wanted Ugg in full calf but could I find it?! 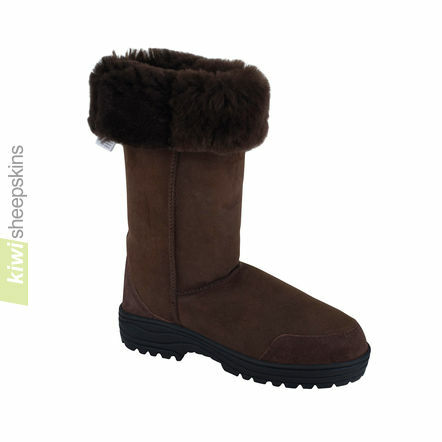 NO.. and the day I found KiwiSheepskin I was about to pay Ugg money then I decided to check if there were any other distributor that may be able to help me find my full calf boots and Look! I found you! Keep them prices low lol. Highly delighted with my recent boots purchase, service was brilliant 5 days from order to delivery to Harwell Oxford. Will definitely be placing another order. Again thank you. Just wanted to say how great my last pair of boots were and I'm extremely satisfied with your professional and prompt customer service. I've been wearing my last pair all winter every year and although their expensive I've never had a pair of shoes or boots that have been near the quality or comfort of these boots. Thanks again for being such a great company. My boots arrived today, only eight days after being ordered. I am stunned by the speed of despatch and delivery, and absolutely delighted with the quality and finish of the boots. I wore them tonight for the first time when out walking my dog, and I felt as if I was walking on air, with my bare feet snuggling into the wonderfully warm sheepskin. The boots are fabulous, and I am so glad that I spent time examining all of the makes of boots available, because I KNOW now that I chose the best - my kiwi feet-warmers. Thank You!! 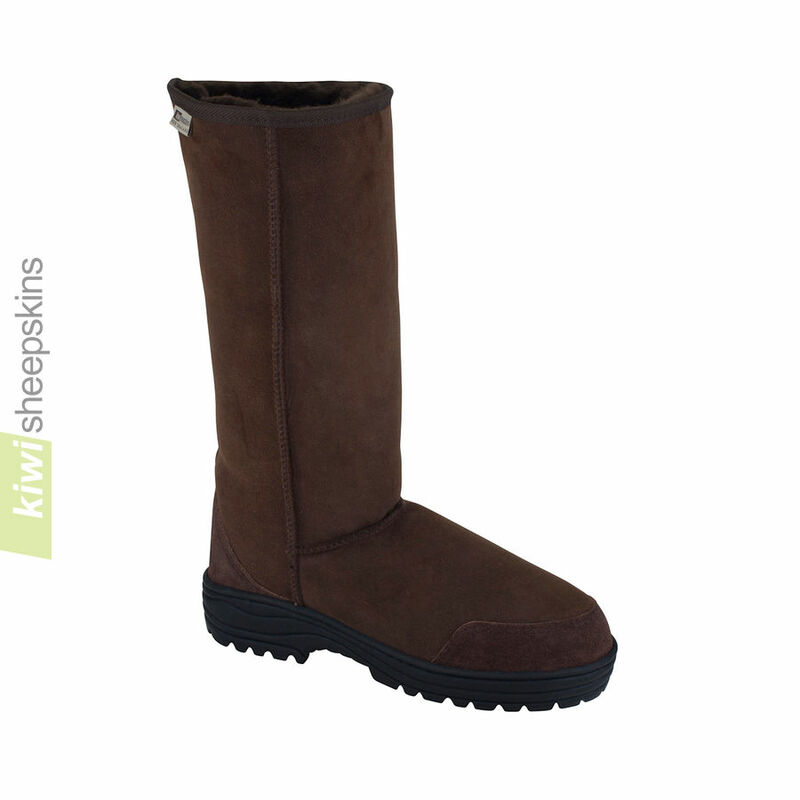 Just wanted to say how pleased I am with my recent purchase of the Tall Ultimate Sheepskin Boots. I was worried about whether the sizing would be right but having followed your guidelines, they fit wonderfully and feel amazing to walk in. I had tried on a pair of Uggs before purchasing Kiwi Sheepskins but the fit is so much better with these and so is the quality and yet they don't cost anywhere near as much. For once I am looking forward to the cold in the UK so I can keep my feet toastie warm! Have received my boots very quickly. I can't believe they only took 6 days to be delivered. They are absolutely beautiful and fit perfectly. The quality is exceptional and I am sure they will serve me well when the cold weather arrives here. I have put a link on to my facebook page and I will certainly recommend to my friends. You never know if I drop enough hints to my husband, Father Christmas may bring me another pair! Many thanks. My Ultimate Full Calf Boots arrived late yesterday afternoon and as it was a glacial -10C here this morning I thought what better time to test them out? I am truly amazed. I have never had anything that keeps my feet as warm as these do, especially bearing in mind they are worn without socks! They are also wonderfully lightweight compared with other winter boots I own. If I'm honest the only drawback is that I just don't want to take them off!!! So thank you for a fabulous product and great service. My boots arrived within 10 days even though shops in the UK have been unable to deliver due to snow, I haven't taken them off since. They are so soft and warm, top quality and look 100 times better than on the website. I will buy from you again. I received today my black Ultimate sheepskin boots. I am delighted. They are even better than the photo, feel fabulous to wear, and arrived in excellent time as it's going to snow! I will definitely be ordering from you again, and will recommend your site to all my boot admirers. Many thanks. I received my tall ultimate boots yesterday, they arrived in the UK within 4 days of being shipped which was brilliant. I love the boots, they are so comfortable and warm and they look great too, I think they will be my footwear of choice over the coming months. Excellent value for money compared to other brands I have looked at and tried on, I will certainly be recommending you to friends. I wish to thank you for my fantastic Ultimate boots which arrived today, I only ordered them on Saturday & they took only four working days to arrive..so fast! They are excellent quality & fit perfectly, they are far superior to my last pair of 'well known' make of boots. I have passed your website on to my friends & will definitely come back for more. Many thanks. I placed my order on 29 September and have just received delivery today 5 October. Fantastic service. And the quality of the boots is even better than I hoped for. My daughter-in-law is going to be so pleased with me! Everything about this transaction has been excellent. Your site is very user friendly, you acknowledged the order and kept me updated and the delivery could not have been faster. Topping it all is superb quality. You are definitely on the 'To be Recommended' list and I will be doing this with great pleasure and confidence. Thank you very much. I hope your company continues to prosper because with this level of service and quality of goods you deserve to. I can't believe the quality of my boots and also the speed in which they arrived. It was an added bonus not to have to worry about UK Customs or VAT because both were already included in the price. The fit was perfect and I can't wait to wear them. Thank you for a good quality product, excellent customer service and great value for money. I'll be back for more.